This client's home had received a full kitchen and living room renovation, so we had great bones to start our design. 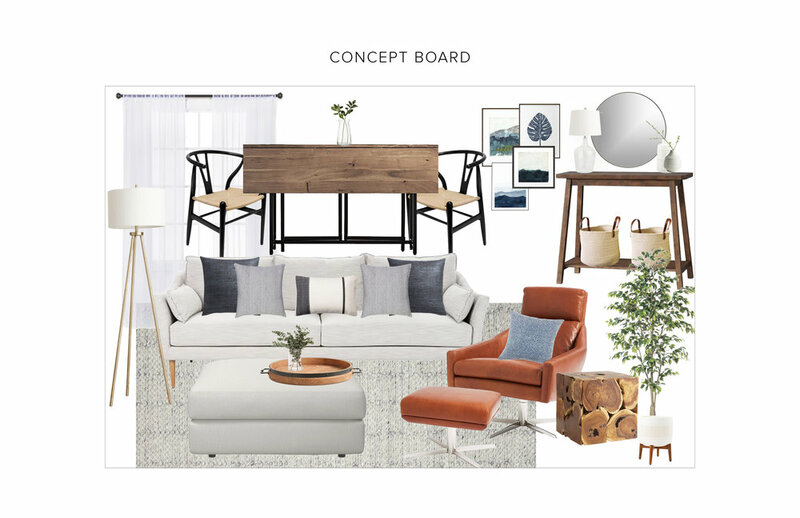 Although the house was freshly updated, the needs of the client didn't quite physically fit into the space, so we had to get clever with some of our choices in order to accommodate as many wishlist items as possible. The primary concern was fitting a dining table where there really wasn't space for one. After several iterations, we ultimately nailed down a great little gate leg table that folds down to console size, but can easily be pulled up for dining without disturbing any other items around it. Placing this behind the sofa, we were able to complete that vignette while conveniently using the dining chairs as accents and added seating around the room, all without overwhelming the space with furniture! Because this space serves so many purposes, we kept the color palette fairly neutral and bright to keep things feeling light and airy, and then added warm wood tones, natural textures, and shades of blue to pull in the rest of the colors from the updated kitchen, really tying the spaces together and creating a cohesive look for this client's first home.